How do I play the Weekly Race? 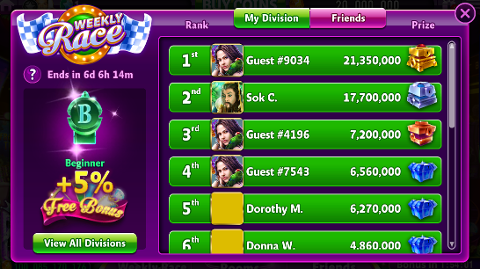 The Weekly Race is a weekly competition wherein 100 players compete against each other. Those in the top of their race will be rewarded with prizes and perks and will be promoted to the next division wherein bigger prizes can be won. The total score comes from slot wins, big wins, bonus games and topper payouts. Topper payouts include mystery gift, big slice, multi progressive, progressive, VIP, and max voltage bonus game payouts. 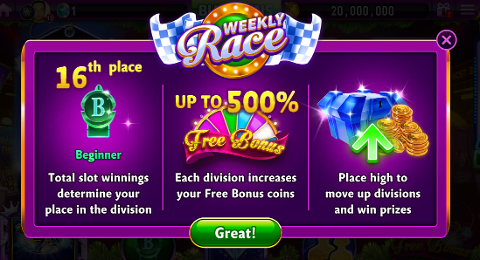 Your position at the end of the Weekly Race determines how many coins you win! As an always on perk, a higher division means more coins when collecting your bonuses! For optimal performance, we also recommend performing these workarounds when using the new interface. Otherwise, contact Support for further assistance. If you have other sentiments, feel free to send them to us through our form. Thanks for your patience and cooperation. What if there was a souvenir room that players could go to and personalize also interact with souvenirs stuffed animals, picture frames, lights, tv, music player. Maybe these souvenirs are earned during a bonus play if a player can't wait to earn it maybe there should be a store to purchase (using coins or real money) Also what if there are secrets in this room and maybe one of the secrets leads to a garden and this garden can be manipulated and changed to suit the player but in the middle of this garden is a machine this machine is locked, The machine can only be unlocked by a series of keys these keys are hidden throughout all the levels but there is a map that will give hints as to which machines would have keys. If you ever need an ideas generator please pick me, if you need a tester who will give honest feedback, pick me, if you need an item from the top shelf, don't pick me, I'm short. and the Munchkins need your help to put it back together again! Work with your team to rebuild the road! the bigger your share of the team prize! We're sorry to hear that, @Pyrefly. While it may take some time to receive a response, rest assured that the Support team remains eager in addressing all of our players' concerns and in providing you the best possible gaming experience. Alternatively, browsing through our Support Site, particularly the articles in our Technical Help Section, may help you out. Re: Missing Billions and SUPER ****! 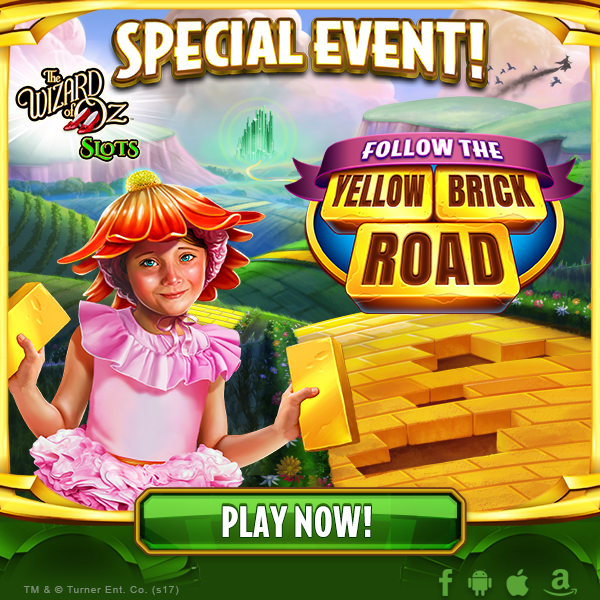 ➧ Were you playing Free Spins or Pick Bonus game? ➧ Did the game crash/freeze? ➧ Relevant screenshot/s, if you got any. 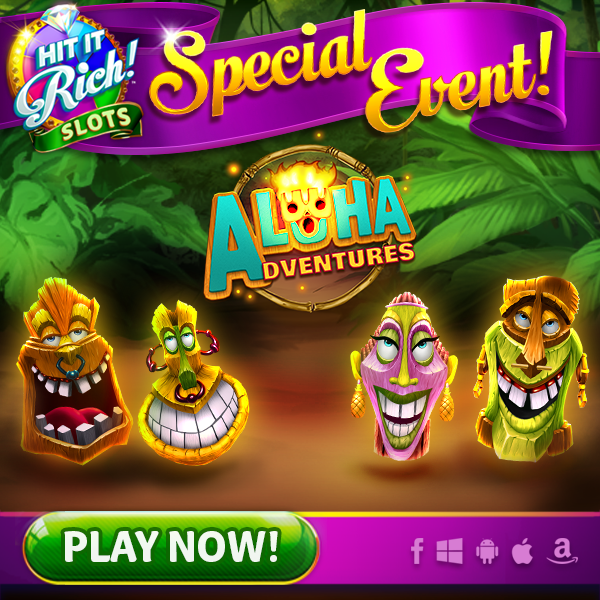 Everyone’s favorite Tiki Gods are going on a tropical treasure hunt in Aloha Adventures! as they explore this island paradise for their lost treasure. so get out there and complete your challenges today! Halloween slot game ~ who the heck are you?? This is for the Halloween slot game on Spin it Rich. There are 4 reels and there is a picture of Laurie, the hospital stationwagon, Michael Myers, a head stone, Dr Loomis, Wild, and then some random picture of a woman holding her hands up..
WHO THE HECK IS SHE? Is she suppose to be from one of the movies? Re: why does the new bonus wheel always fall on the lowest denomination? Appreciate the feedback, Spinners. The amount of Coins is randomly given on the Bonus Wheel. 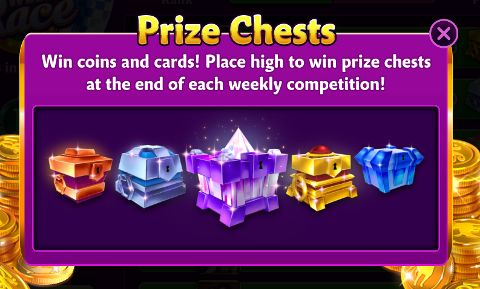 Please continue playing and you may receive higher next time. For additional feedback, feel free to fill out this form. 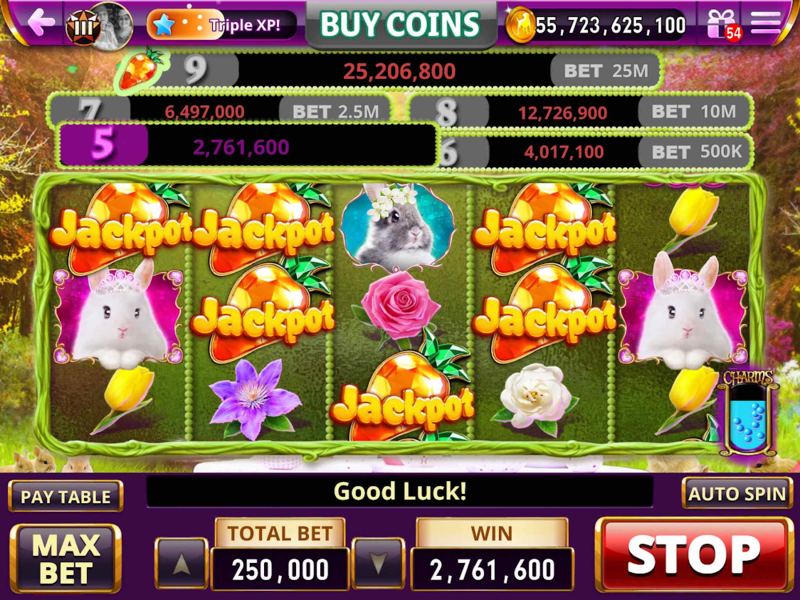 The player got 6 Jackpots and should have received 4,017,100 Coins; however, the minimum bet was 500,000. Since, she only bets 250,000, the award given was 2,761,600 Coins instead. To have your account checked further, please get in touch with our Support team.